Verizon Communication’s Global Strategic Sourcing & Procurement Group held a 2 ½ day meeting and team building in Newark, NJ at the Marriott. After breakfast, the group was revved up with carbs and ready for a fun-filled team building activity to kick it all off that would introduce new team members and offer the group an opportunity to get to know each other better. 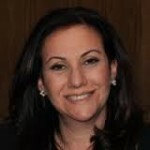 The Global Travel Manager at Verizon who organized the event had previously participated in a similar event and was excited to introduce The Leader’s Institute® to the group. The facilitator, Michelle Riklan had the team active and on their feet as participants “raced” to get to know each better — some were more aggressive than others! After being sorted and joining new “teams”, what seemed like a fierce competition to complete given tasks ensued. There was quite a lot of laughter throughout the room as new alliances were formed and projects were completed. 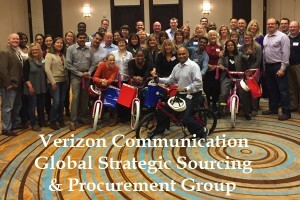 At the end of the event, each team had built a brand new bicycle and the Vice President, Strategic Sourcing & Procurement at Verizon Communications “safety checked” each and every one himself! After he took each bike for a spin, Cynthia Banks from the Boys and Girls Club of Newark BGCN (an organization committed to enabling all young people, especially those who need us most, to reach their full potential as productive caring responsible citizens), gave a presentation about the organization and collected the bicycles for children at the BGCN. For details about a team building event in Newark, NJ, click here!